Oral language is said to be a huge predictor of future reading success. In fact, several studies support the idea that a preschooler's vocabulary is the strongest predictor of future reading success. Many children will develop oral language through hearing books read aloud and through being spoken to by adults and other children. My two year old son, Tyson, has struggled with oral language development. There are many factors that have contributed to his delay. One huge issue is that he has had a lot of fluid in his ears. Another factor is that he has a very verbal older brother. A third factor is that he is just a chill-laxed kid. He doesn't see a need to be jabbering non-stop like his big brother. If we ask him to use a word or repeat a word, he gives us a "is this necessary??" look. 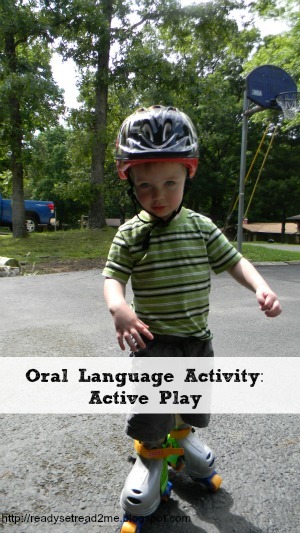 Tyson needs some oral language practice to help him develop his speech and language. 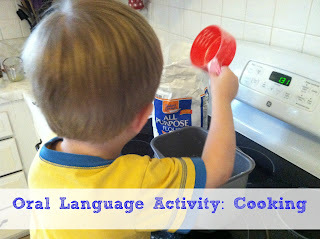 He probably needs his language instruction to be more direct than other children might. He also needs oral language instruction to be within the context of his every day life and in a way that he finds enjoyable! We participate in a program called Parents as Teachers, which is a free program provided by our local school district. A parent educator visits us in our home and gives us suggestions for how to work with our child. 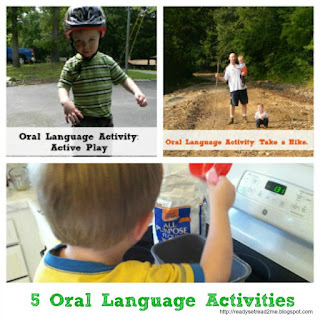 We have an amazing parent educator, and I used some of her resources to create this list of five oral language activities for preschoolers. 1. Use active play times like skating or bike riding as an opportunity to introduce the words stop, go, fast, slow. 2. Take a hike. Look for objects that are high and low or big and little. 3. Play "I spy" in the grocery store check out line. This has become my favorite grocery store peacekeeping game. While we are waiting in the check out line, I say, "I spy the bananas." The boys have to peek in to the cart and point to the bananas. I've tried to add adjectives like, "I spy the yellow pepper." I've also tried to beef up my older son's vocabulary by using words like, "cheddar cheese" instead of just "cheese". The boys love this game! 4. When playing on the slide talk about up, down, top and bottom. 5. While cooking use the words full and empty, in and out. Do you have any fun oral language activities for on the go two year olds? I'd love to hear them! 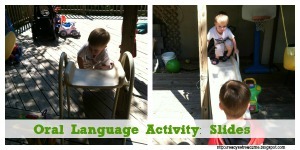 Love developing oral language during fun play activities. Thanks for sharing. 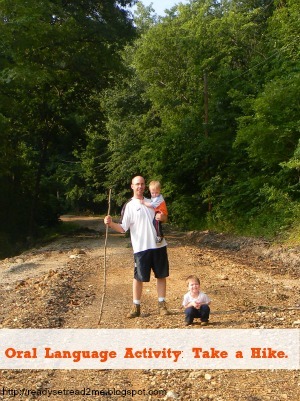 Talking through activities while we do them is so beneficial. 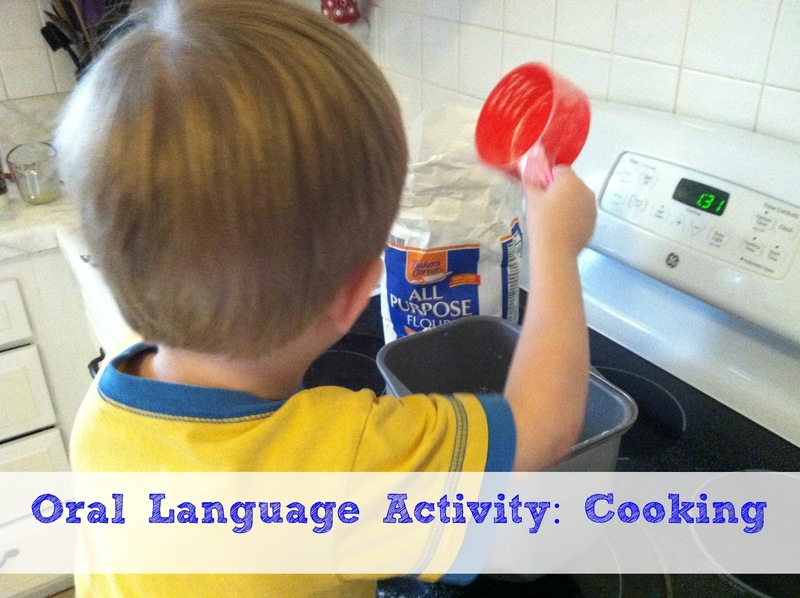 I'm amazed by my 22 month old's receptive speech. Now we just need the expressive to click on. Great post! I have four boys, and my older two had an impressive vocabulary at a young age. My 13 month old twins hardly say a few words. I keep reminding myself I need to talk to them with a broader vocabulary and be more purposeful about it. Whoops...Thanks for linking up to The Sunday Showcase!